What is this feeling, Google? When Ransom Olds developed the modern assembly line (a little history lesson to liven up your day), it sparked a revolution of process that we still employ. Ford went on to perfect the process, and since the early 20th century, cars and much more have been produced in a near-seamless fashion, all thanks to a change in manufacturing. 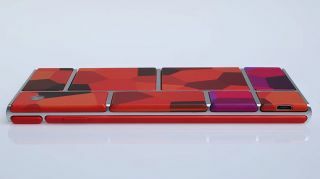 I don't know why, but Google's Project Ara has me excited in a way I haven't felt about technology in a long time. No, scratch that, I do know why. The up-swell in my gut and tingling in my toes must have been what industrialists felt when the first four-wheelers started rolling out off assembly lines; this could change the way we do things forever. For me, Project Ara isn't so much about the hardware, though there is magic in mixing and matching your phone parts, than it is about revolutionizing the way we produce and access means of communication. In discussing Project Ara with someone whose opinion on tech I trust, he played advocate for the pre-fab phone, "Why not just buy something that has all the pieces right there [points to his iPhone], and that works?" His point was fair and it's not like Project Ara and other modular gadgets will do away with integrated, self-contained smartphones. That'll never happen. But the fact that we are so close to having choice, real choice, when it comes to what parts constitute the things that live in our pockets is undeniable. And undeniably exciting. Google isn't the first or only company working on modular phones, but it's certainly the most prominent. The Advanced Technology and Projects group spearheading the project is quite serious about making modular phones work, and addressed many of the questions surrounding the tech in a recent Time profile. For the questions it couldn't answer, like how do all the parts keep from scattering when someone drops their Ara on the train, ATAP assured that it's at least considering all the variables real life, not just lab tests, throws a phone's way. Still, innumerable question marks remain as to how this will all work, including making the components on a large scale and at a reasonable price. Google is working with a 3D printing firm to develop a system to crank out customized Ara parts, but developing and producing are two very different things. Perhaps even more pressing, as a Fierce Wireless column from October 2013 addressed, is whether people want modular phones to begin with. Consumers were taken with the Moto X's Moto Maker, but then they were only picking out case colors and accents. Do consumers, not just enthusiasts, actually want to take the time and take on the stress of choosing their phone's nuts and bolts? I can't answer that question, but I think once Google has a working model to show, it should sway many minds either way. At the heart of Ara is the issue that has influenced some major moves lately; how to reach the next billion-plus internet users. Just as Facebook spent a ridiculous amount of money to acquire WhatsApp, Google seems to be going whole-hog on a solution to reach people it hasn't already with mobile internet technology. Five billion people, to be exact. In the words of Project Ara lead Paul Eremenko, the platform is designed for six billion people: one billion existing smartphone users and the rest on feature phones. What's more, Ara is about opening hardware in the same way Android has opened software - put it in the hands of the many as opposed to the grip of a few. It's done this to some extent with the Nexus line, but Ara is about to take it several steps further. The assembly line of Industrial tycoons was about wresting control and turning greater profits for those in charge. Google will be far from a passive and non-profiting owner of Project Ara, but if it can bring more choice to consumers and more opportunity to get in the game to developers who want to make phone components, I say more power to you. Of course, it can't be ignored that Project Ara phones would only expand Google's reach, slipping its fingers into corners of the world still untouched by the technology prevalent in developed countries. Gaining more Android, Gmail, Google Now, Google+, Google-whatever users would only benefit Mountain View and its advertising partners. The company thrives on hyping new tech that may be years away from public release. Whether it's genuine good-will and enthusiasm or a way to keep antsy investors satiated or both, the fact that a company as big as Google dares put its name and money on the line bodes well for the modular phone future. There's much bemoaning the lack of "wow" in today's smartphones, but from where I stand, a new kind of wow is right around the corner. Can Google succeed where other modular phone makers have failed? It has a better chance than most, though the hurdles are undeniable. Pieces still need to be fit, but Google has put squarer pegs into rounder holes before. It can do it again.